On Saturday, 27th June, Srs. Una Rutledge, Regina Mc Cullagh and Thuy Linh, attended a Religious function in the Redemptoristine Convent in Drumcondra, Dublin 9, to mark the year of Consecrated Life. The title of the event was “The Rise of The Roses”. 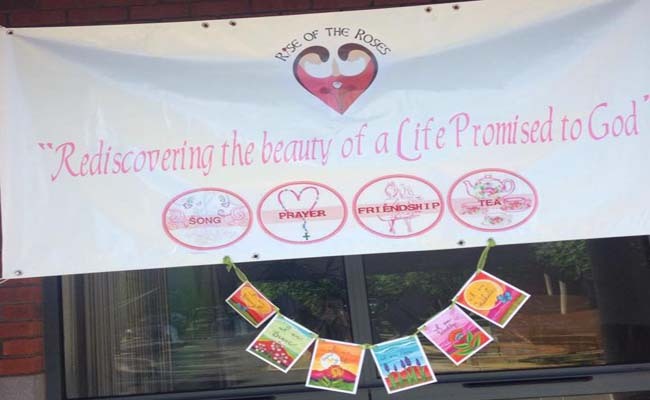 The actual Roses are a group of young people from the North, who, as volunteers at the Michaela Girls’ Summer Camps, have discovered a great desire for the things of God and an eagerness to spread their enthusiasm, energy and joy. This led the group to The Poor Clare’s Convent at Faughart, Co. Louth, Eamonn Martin, Archbishop of Armagh, was present. He introduced them to the people and blessed their project. The sisters had asked their help in following Pope Francis’ call for Religious Congregations “To Wake Up The World” in this year for Consecrated Life (November 2014 – November 2015). They had willingly cooperated and through the intercession of St. Brigid, Clare, Teresa of Avila, St John Bosco,and the inspiration of the late Michaela Mc. Areavey, who had been murdered in Mauritious, while on her honeymoon, they had come up with the idea of a Summer Tour to ten convents for ten Saturdays, from June 13th to August 15th 2015. 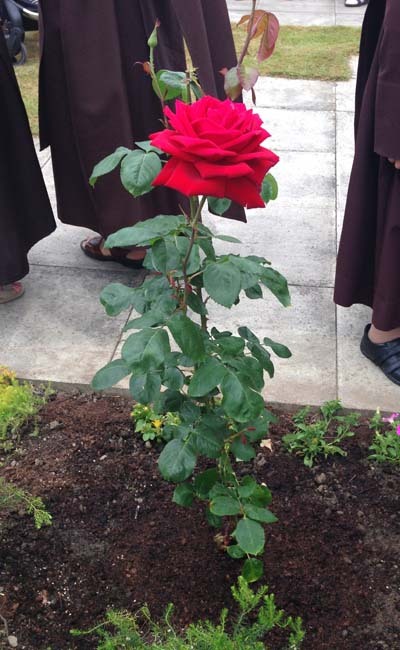 The Roses had begun in the Poor Clare’s Convent in Faughart, and proceeded from there to the Adoration Sisters, Belfast. Their third stop was the Redemptoristines in Dublin, where we joined them for the afternoon. The Tour will end at the Knock Shrine on August 15. Mass was celebrated in the morning. We were unable to be present for it but we were in time to hear the Roses interviewing sisters from the Redemptoristines, Poor Clares and Carmelites on their Way of Life, including their prayer, work and recreation. It was very interesting to compare the similarities and differences in the three Congregations. After the testimonies, we went to the chapel for the rosary, which was followed by solemn Evening Prayer. There was a break at the short response, for a half hour of Adoration, after which Evening Prayer was resumed. A cup of tea followed, where greetings were exchanged. Then it was time to disperse. The Roses needed to get ready for the next leg of their journey, which would take them to Drogheda with the Dominican and Franciscan Orders. A nice young nurse gave us a lift to the city and showed an interest in visiting our convent at a later date.